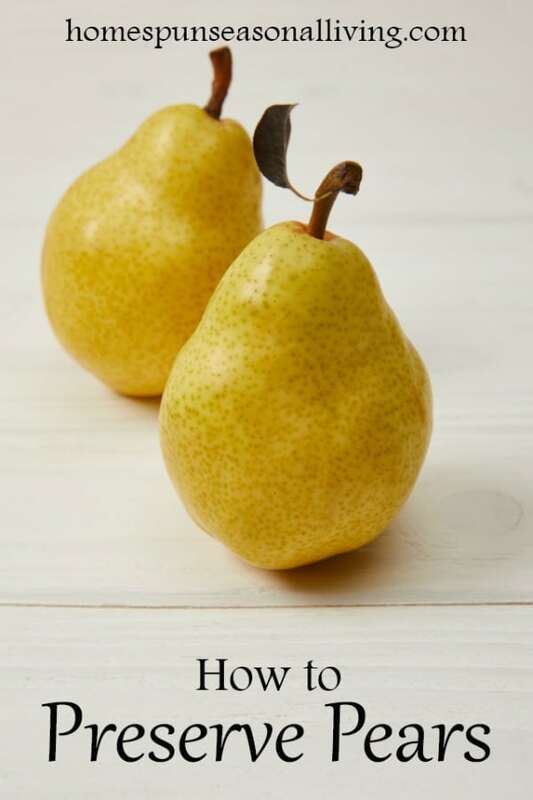 Pears are a gift from the fall season. They're sweet and nutritious. 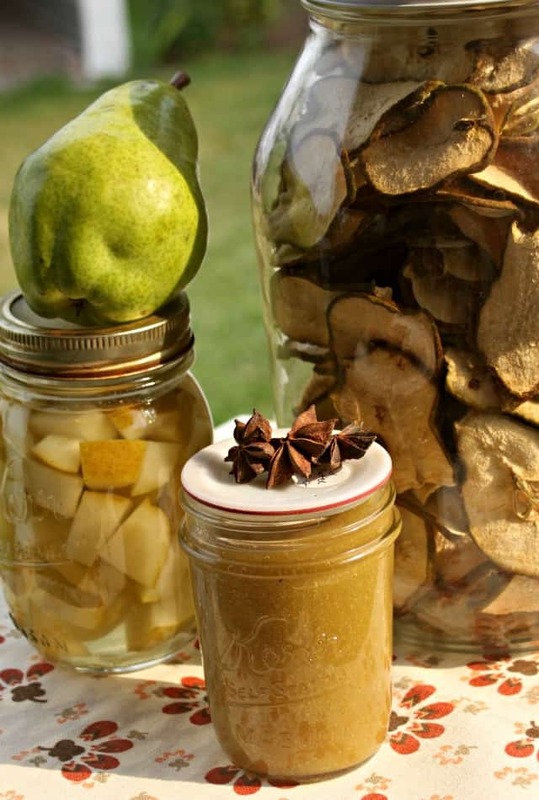 Pears also make for incredible and easy food preservation. Make the most of this season's fruit for next season's eating with these pear preservation methods. Because the canning process can make for mushy pears, I like to use slightly hard / underripe pears for canning in this fashion. Peeling is optional – I always skip the peeling because I'd rather spend the time doing something else. Simply core and pack jars with pear halves or chunks. Can the pears in a sugar syrup (extra light is my favorite), but it can be done in plain water too. For an adult treat, add some almond liqueur to those jars. Process jars in a water bath canner 20 minutes for pints, 25 minutes for quarts – adjusting for elevation. Note: Supposedly raw packing pears makes for poor quality, I always raw pack and find it just fine. You probably won't win a blue ribbon at the fair if you raw pack but it is not a safety issue. Combine pears with seasonal apples for a delightful jam. Add some dried cranberries for a sweet and tart jam. Much like apple butter, pear butter can be made by cooking it down until thick. Add some subtle spices or vanilla for something quite flavorful. Much like apples, pears make a delightful sauce. This is a great way to use already overripe pears. Simply make in the same way as applesauce. Can it chunky or pureed. It freezes well too, for those that want to skip the canning process. A mixture of apples and pears for an apple-pear sauce is amazing, indeed. Again, peeling is optional. Simply core and chop pears. Store in containers and freeze. I find it easiest to do this in 2 cup measurements for easy baking later. Frozen pears make great fruit crisps and pies in winter. They're also delightful in smoothies. Slice pears and dry them in a dehydrator for a delicious snack. Again, peeling is optional do what works best for your family and taste buds. Once dried, they're so sweet they're just like candy. Dehydrated pears will last quite a long time in the pantry and can be rehydrated for cooking. Use dried pears in baking, oatmeal, and for just snacking. Pear leather is a perfect snack for children and much healthier than store-bought versions. This fall, don't be shy in gathering up those local (or fruit stand bargain) pears and putting them up with these easy preservation methods. Your tummy and pantry will thank you later. 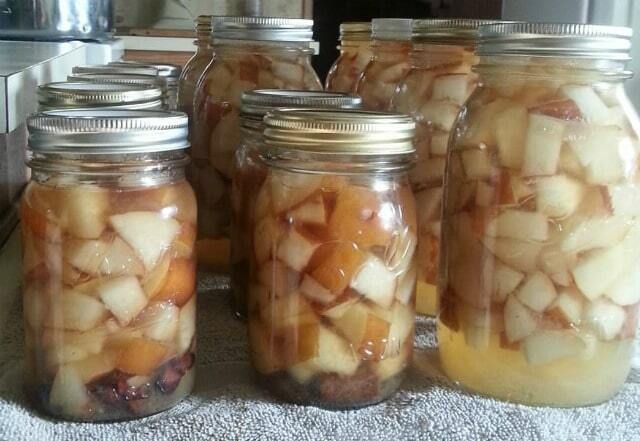 What's your favorite way to preserve pears? Thank-you for all these ideas. And thank you for the tracking sheet. I am hopeful this will prevent jars and freezer items lurking in the dark depths of my store shelves or freezer! Filling it in certainly makes my efforts look impressive!! I have decided to do a separate one for the freezer. I have also made separate lists for 2018 and pre-2018, as I still have some things left from 2016 and 2017. Oh I’m so glad to know that tracking sheet is useful to you! Happy preserving. 2007 - 2019 Kathie N. Lapcevic. You can link to this site as much as you want, but please don't use any content or photographs without my permission. If there's something you want to use somewhere else either online or in print, e-mail me and we'll work it out.